Siem Reap, Cambodia. Plenty to do for travellers. There’s amazing tours in Angkor Watt, nightlife along pub street and alleyways full of food traditional Khmer barbecues. No doubt about it, Cambodia’s original tourist town offers everything an adventure traveller could ever need. However, as is too often the case throughout many impoverished countries, the huge influx in tourism has made the area a hotspot for travel scams. One of the more infamous scams in the area is the Milk Scam. Basically it works like this. Instead of asking for cash, many of the street kids beg tourists to buy them milk from the surrounding convenience stores. Thinking they are doing the children a favour by buying them something of substance, many tourists, led by the hand of these malnourished and often orphaned children, head to the stores and buy up a supply of milk to give to the children. The children take the milk with hurried thanks and the tourist’s leave satisfied that they have done their good deed for the day. What happens next is disturbing. Instead of drinking the milk and providing themselves with much needed sustenance, the children head back into the store, selling the milk back to the owner for a fraction of what tourists bought it for. The children then take the money to “pimps”, who pay them an ashamedly low sum of money to roam the streets on the lookout for gullible tourists. These children are often subject to abuse if they fail to meet daily “quotas” and activities like these keep many of them out of schools and on the streets. Lately there has been an even more disturbing development. Young women with infant babies are been used by milk scammers to stand outside of convenience stores, begging tourists to buy milk for their sick babies. Once again, the milk is sold back to the store and virtually none of the money returns to the young women. Sadly there is only one option to put a stop to this exploitation, stop buying the milk. Charity organisations in the area such as Think Twice have been doing their best to spread the message to tourists to stop buying from kids on the street, with the motto, “Let parents earn and children learn”. Although some may see the Milk Scam as a classic example of locals exploiting tourists, it should also serve as a deeper reminder of the desperation and exploitation poverty brings to communities in developing countries across the world. We’re doing our bit with Changemaker Program. What kind of scams have you seen overseas? This is such a confronting and emotional thing to experience and it’s devastating to know that any help we do offer usual goes in vain. 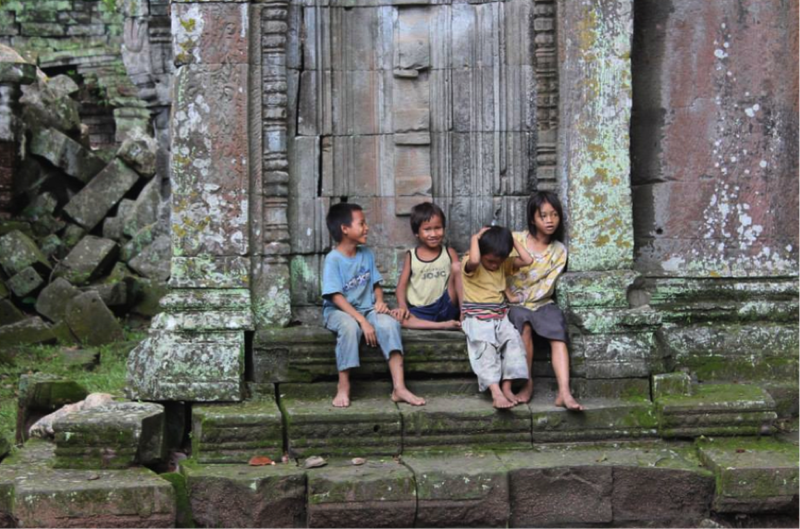 When I arrived in Phnom Penh for the first time, our taxi was approached by a group of young begging children. I was really startled at the fact they approached our taxi while idle at a red light and knocked on the windows to beg. It was on a really busy highway and it was also late at night, which added to my worry. This was my very first experience with begging children in Asia (which was followed by many more throughout my last trip). Good to see there are programs out there attempting to break the cycle and good to see Australian companies such as yourself supporting these programs. Kids should be in school and not on the streets where they are exploited like this. I think that the local authorities in Cambodia should crack the whip on milk peddlers that are found exploiting children. But, it is is good that there are some organizations spreading word about this milk scam. There are many variations of the “poor kid” scam. In Manila they will come up to your car in traffic with flowers carrying a broken toy, and then if you give them money, it all goes to their minder. Sick. Thanks for your comment, James. It’s awful to see children taken advantage of like this.